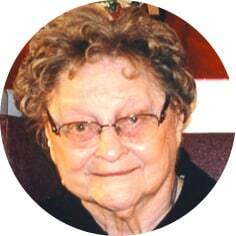 It is with profound sadness that the family of Daisy Baer announces her passing on Saturday, March 16th, 2019 at Providence Place in Moose Jaw, SK at the age of 86 years, surrounded by love. She was predeceased by her daughter, Marlene Baer; parents, Pauline and Sandy Bubyn; and four brothers and sisters. Left to mourn Daisy’s passing are her granddaughters, Tammy (David) Johnstone of Coderre, SK and Colleen Anderson of Moose Jaw, SK; great-grandchildren: Dustin, Dakota and Logan Beach; brother, Willard (Rose) Bubyn of Regina, SK; several nieces and nephews; and her special friend, Jean Moerike. Daisy’s granddaughters would like to extend their heartfelt gratitude to Dr. Hugo, the caring staff at Edgar Hall in Providence Place, and Dr. Vertue at the Dr. F.H. Wigmore Regional Hospital. A Memorial Tea in Daisy’s honour will be held on Sunday, March 24th, 2019 at 1:00 p.m. in the Harvey Room at Moose Jaw Funeral Home. A private family interment will be held at a later date. As an expression of sympathy, donations in Daisy’s name may be made to the Alzheimer Society of Saskatchewan, 301-2550 12th Ave, Regina, SK S4P 3X1 or Diabetes Canada, 919B Albert St, Regina, SK S4R 2P6. Arrangements are entrusted to Moose Jaw Funeral Home, 268 Mulberry Lane. Gary McDowell, Funeral Director 306-693-4550. Sad to hear Mrs. Daisy Baer has losted her life in death. To comfort the family what hope is open for our love ones, the Bible gives us this promise in Acts 24:15. Also my wife and I like to offer our sympathy to all in the family and friends.